Minimize wood contact with the ground. Most termite infestations are caused by wood being in direct contact with the soil. Ground to wood contact provides termites with easy access to food, moisture, and shelter, as well as direct and hidden entry into the home. Wood siding, lattice, door frames and similar wood items should be at least 8 inches above ground level. Eliminating wood to soil contact may require regrading or raking soil and mulch back from the foundation, cutting the bottom off of wood latticework, or supporting steps or posts on a concrete base. 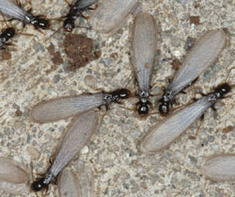 Posts or stairs that are embedded in concrete are also vulnerable to termites since they usually extend all the way through the concrete to the soil. Contrary to popular belief, wood which has been pressure treated is not immune to termite attack; termites will enter pressure-treated wood through cut ends and cracks, and will also build tunnels over the surface. 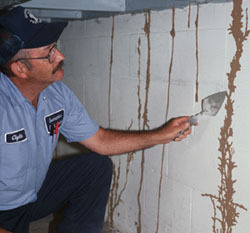 Don't let moisture accumulate near the foundation. Termites are attracted to moisture and are more likely to be attracted to a structure if the soil next to the foundation is consistently moist. Water should be diverted away from the foundation with properly functioning gutters, downspouts and splash blocks. Leaking faucets, water pipes and air conditioning units should be repaired, and the ground next to the foundation should be graded (sloped) so that surface water drains away from the building. Homes with poor drainage may need to have tiles or drains installed. Lawn sprinklers and irrigation systems should be adjusted to minimize water puddling near the foundation. Reduce humidity in basements and crawl spaces. If you have a basement or crawl space try to keep it ventilated. Vents should be kept free of leaves, dirt, and debris, and should not be obstructed by vegetation. Moisture and humidity in lower levels of the home can further be reduced by installing polyethylene sheeting over the soil surface. The cover will act as a vapor barrier to reduce evaporation from the soil and condensation of moisture on joists and sub flooring. Never store firewood, lumber or other wood debris against the foundation or inside the crawl space. Firewood, lumber, cardboard boxes, newspapers, and other cellulose materials attract termites and provide a source of food. When stacked against the foundation they offer a hidden path of entry into the structure and allow termites to bypass any termiticide soil barrier which is present. Vines, ivy, and other dense plant material touching the house should also be avoided. Where practical, dead stumps and tree roots around and beneath the building should be removed, along with old form boards and grade stakes left in place after the building was constructed. Use mulch sparingly, especially if you already have termites or other conductive conditions. Many people use landscape mulch for its aesthetic and plant health benefits. Excessive or improper usage, however, can contribute to termite problems. Termites are attracted to mulch primarily because of its moisture-retaining properties, and the insulation it affords against temperature extremes. The mulch itself is of poor nutritional quality to termites and a non-preferred source of food. Since the moisture retaining properties of mulch are more of an attractant than the wood itself, it makes little difference what type of mulch is used (cypress, pine bark, eucalyptus, etc.). Contrary to popular belief, crushed stone or pea gravel are comparable to wood mulch in terms of attraction, since they also retain moisture in the underlying soil. Where mulch is used, it should be applied sparingly (2-3 inches is usually adequate), and should never be allowed to contact wood siding or framing of doors or windows. Consider having the structure treated by a professional pest control firm. Buildings have many natural openings through which termites can enter, most of which are hidden. While the above measures will help make the house less attractive to termites, the best way to prevent infestation is to protect it with a termiticide. Preventative treatment for termites is a reasonable investment, especially if the structure has had no prior history of treatment. If the building was previously treated by a pest control firm, it's a good idea to maintain the warranty by paying the annual renewal fee. Pencil-wide mud foraging tubes on foundation walls. There is no accurate way to determine the age of discovered damage. This is one reason why an annual inspection is valuable. Keep records of all inspections. 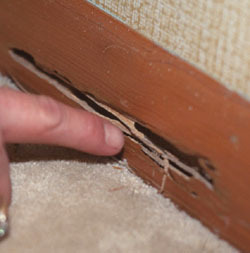 Allied Home Inspections LLC can inspect for wood destroying insects (including termites) during your house inspection. Please note that an inspection is not a guarantee that you do not have termites or damage in visually inaccessible areas, such as inside walls or behind finished basement surfaces. However, an inspection can reveal conditions that might suggest that damage does exist and further investigation or treatment is needed.